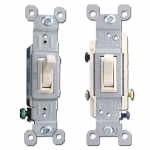 Enjoy one-stop shopping for almond electrical outlets, rocker & toggle switches, and light dimmer controls by major electric device manufacturers. 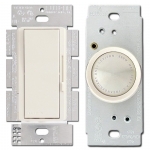 Easily complete a construction job or home remodeling project with a great selection of devices for updating your home or office phone, cable and lighting needs. Shades of almond vary by manufacturer. 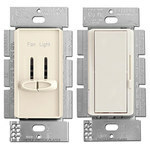 If you purchase almond light switches and outlets made by different manufacturers, please not that there will be some variance in color, as shown below. 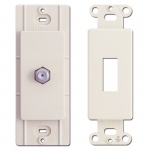 The best match for almond electrical devices (regardless of manufacturer) are our metal light almond switch plates. 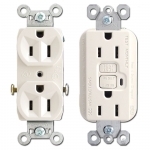 If you're trying to choose between ivory or almond devices, use this image as a guide for comparison. 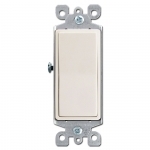 Ivory switches are darker and more yellow than our lighter almond ones, and coordinate best with our ivory cover plates.